Every second and a half, Apple sells another iPhone. Cupertino today announced its best ever sales and profit figures, outside Christmas quarters, in the company's history. The hardware and software giant reported making about £750 million profit on £5 billion of sales in the third quarter of 2009. "We're making our most innovative products ever and our customers are responding," said Steve Jobs, Apple's CEO. Profits are up about 14 per cent over the same period last year, with Apple selling over six times as many iPhones as in Q3 2008. 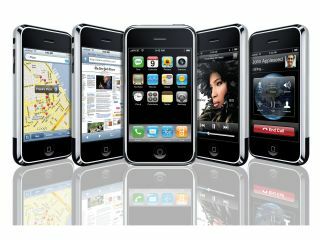 "Response to the new iPhone 3G S has been tremendous," said Peter Oppenheimer, Apple's CFO. "We are currently unable to make another iPhone 3G S to meet robust demand but we are working to address this." Away from the iPhones, figures weren't quite so rosy. Mac computers enjoyed a mild sales increase of 4 per cent to 2.6 million units, although that hides a 10 per cent slump in the sales of desktop computers (compared to a 13 per cent increase in laptops). iPod sales accelerated their decline, selling 7 per cent fewer media players than last year, although the overall quantity - 10.2 million units - is still more than all other Apple products put together. Oppenheimer said: "We predicted this decline. This was one of the reasons we originally developed the iPhone and iPod Touch." International sales comprise 44 per cent of Apple's total, with Europe alone providing about a quarter of the company's revenue.